We purchased a used Gulfstream Sun Voyager last year as our introduction into the RV world, and have loved it ever since! 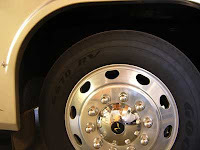 I have read in many RV magazines that protecting the tires on these units is critical. Our RV has been in outside storage without covers since December. When we bring it out in the spring, I would like to "dress" the tires with something to help keep the rubber soft and protect their life some. What is the best thing to buy or use for this? Tom, I have had good success over the years using a product called 303 Aerospace Protectant. It used to be called AP 303 in the old days. It's available at any well-stocked RV retail store. Avoid products containing silicone or any other type of petroleum distillate which can actually dry out the tires making the thinner sidewalls more vulnerable. Ever notice a real "shiny" finish on a recently dressed tire? Yes, it looks nice, but chances are it is not helping to extend the life of that tire or protecting it from ultraviolet sun damage or that nasty ozone that is common in many locales. 303 will not leave the tires shiny, but it is effective. And still consider some tire covers for the next storage period also. You can't beat double protection. For more detail on tire protection, see my response to Murray.